Home » Pressing times at Harmony Timber! Due to increased demand and order levels we are happy to announce that we have purchased and installed a new Truss Press from AV Birch. 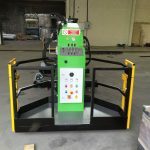 With the new press we can significantly increase our production to help satisfy the demand. The pictures below show the press being delivered through to the complete installation. 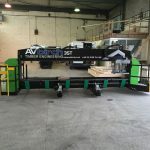 The roof truss press is fully automated and is one of the safest forms of manufacture for timber roof trusses. The press is capable of standard fink trusses all the way up to complicated ‘room in the roof’ attic style trusses. Birch Roof Truss Presses have long been seen as the most versatile Roof Truss Presses available in manufacture processes. The combination of a simple control set, rapid start up times, lower downtime and increased production speed help achieve higher productivity regards of truss configuration.